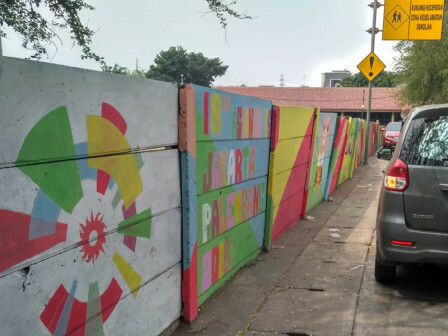 13 roads in Pegangsaan Dua Urban Village, Kelapa Gading Sub-district, North Jakarta are beautified to welcome Asian Games 2018. It is done by painting the area, decorating it with mural, cleaning up water channels, concrete curbs and sidewalk, and greening.
" Our target is to complete it before August 17"
Pegangsaan Dua Urban Village Head, Abdul Buang explained, his side has arranged several roads such as Jl. Kepu, Jl. H. Oyar, Jl. Nias Raya, Jl. Hibrida Raya and Jl. Pegangsaan Dua Raya. "We target to arrange 20 roads. While we have arranged 13 roads and the remaining will be arranged immediately. Our target is to complete it before August 17," he informed, Thursday (8/2). He explained, his side paints 40 bridges and eight RPTRAs. His side also paints Asian Games murals, logo, and flags on each RPTRAs. Arrangement has started since early July and involved residents of RW 01, 02, 03, 04, 05, 12 and RW 25. Besides arrangement, Asian Games banners and flags are also installed on those 20 roads as decoration. "Our region has a featured culinary spot. We are ready to welcome foreign tourists who want to visit our region," he affirmed.